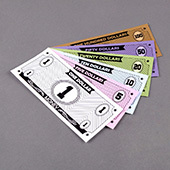 Design your very own custom play money, perfect for business themed board games that revolve around money. Design and print your own custom printed play money to make board games suitable for kids. It is an excellent teaching tool for teaching your kids how to count, handle and manage money. 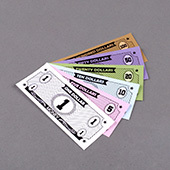 Have fun role playing money exchanges while playing your board games together. Creating your own custom paper money is easy and quick, simply choose your size and quantity on our easy to use online builder and upload your design/artwork to have it printed and delivered to you. 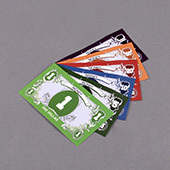 As well as paper money we also have various game pieces to go with your board games as well as predesigned paper money suitable for many kind of games. BoardGamesMaker.com is wholly owned and run by QP Group. An industry leader with over 30 years experience in the table top games industry. BGM is the leader in custom board games and card games printer. Our online games builder makes it easy to make board games yourself. BGM is your ultimate one stop shop to publish board games with great supportive print service. Choose a paper money size. We have small, medium and large.